this polish i got in a swap from the lovely and talented miss gildedangel of naive nails. go check her out if you haven't already, cuz she's AWESOME possum and super sweet. i felt like maybe i was pulling the wool over her eyes a bit when i fished this out of her swap bag when we met up last winter (although there is still snow on the ground here, so it might still technically be winter). 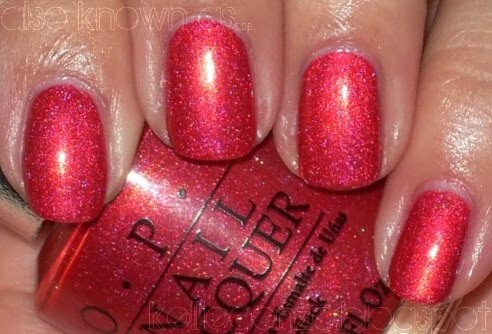 did she seriously put an OPI DS series polish in a swap bag??! seriously? dope! i even double checked and yes indeed miss samantha did not care for the polish so it quickly became my little treasure. idk about you kids, but $12 for an OPI is a bit much. and i freaking love OPIs. i will pay it for a really spectacular amazing DS polish (a series OPI calls "designer" and has diamond dust in it) but honestly i could really pass on a lot of them. so yeah i felt special and lucky to get this pretty lady! ds reflection is a beautiful berry coraly pinky reddish color with tiny holo glitter sparkles. there's also a hint of gold duochrome in the bottle, but i couldn't see it very much on the nail (however the flash pictures pull it out a bit). very smooth, even and opaque coverage! this is two coats. this mani was very glam in my opinion, very old hollywood. which usually seems more dark red or whatever, but this looked really classy against my skin. i adore it, thanks again samantha!